Discussion in 'The Beat of The Brass: Herb Alpert/Tijuana Brass' started by Rudy, Aug 22, 2017. Releasing Sept 29, 2017. Available for preorder now. I just can't wait to hear Herbs new Christmas album! I really like this Christmas album. Herb will be performing "Santa Baby" on the Hallmark Channel Christmas Concert series on Nov 3rd and the show will be re-broadcast throughout the holiday season. This will be recorded live. Ronnie Madrid, martin, Nathan Strum and 3 others like this. 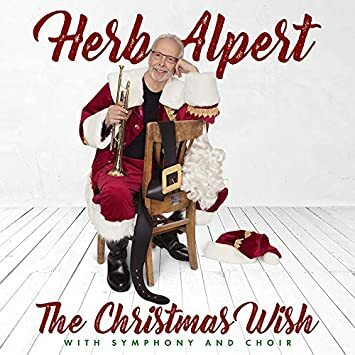 I love the cover...a subtle wink to Herb's first Christmas album...almost like he's saying it feels good to get the beard and hat off and loosen the belt after 49 years. I'll grab it in December. Hopefully the vinyl won't sell out by then! I will buy it first week of October around payday but I will wait to play it until late November after Thanksgiving when I normally start playing holiday music. Ronnie Madrid and Rudy like this. We will live vicariously through your purchase. But, I can stream it on Tidal until I get my copy of it later on. I sometimes get new releases (especially vinyl) on or near release day, but I'll be away from home for a few weeks. I've got mine on order, but I can't decide whether to play it on arrival or wait until "the Christmas season" kicks in. Currently most of my Herb listening has been a 19-song best-of compilation playlist composed of songs ranging from his most recent studio albums, with a couple of tracks from Re-Whipped thrown in for good measure. It's a kickass set. Mine is on order as well, but I don't start playing Christmas music until Thanksgiving. So it will have to wait on the shelf a couple of months. This is a fantastic album, at the top, one of Herb's very best. Anyone who waits to get it or waits to play it, is definitely missing out! Order now, get it and play it as soon as you can. THE CHRISTMAS GIFT from Herb arrives early this year - long before the first snow. ENJOY! dualstacker, Ronnie Madrid, martin and 1 other person like this. long before the first snow. Uh-oh, too late...we had the first snow here a couple weeks ago! You'll probably have guessed that Radio Six International will have some tracks on release day in 'The Lively Lounge' although thereafter probably a gap before I start playing it on air for obvious reasons. It's a really fantastic record (good ol' vinyl!) and without a doubt one of Herb's very best! Isn't Richard Carpenter appearing on this disc? Mark-T and Chris May like this. I absolutely agree with Steve, this must be one of Herb's best albums ever. The full album was released this morning on Spotify. It sounds fantastic, the arrangements are beautiful and some of them are actually quite fun also. There is a joyous and festive mood throughout the record and Herb's playing is as good as I have heard it. Just a superb, superb album. And it wouldn't take much for me to throw in another "superb" - there, I just did! It arrived on my doorstep today and I had a nice listening session this afternoon. It is so refreshing to hear real musicians playing and Herb has never sounded better. I bought the CD version which comes in an actual digipak type of case. That is, with a plastic holder inside the gatefold opening, with a front pocket to hold the booklet. Most of Herb's recent CDs had the disc inside the right pocket of the cardboard. This is more secure - as long as the teeth in the holder don't break. Lani sings one song - the title track, and she sounds great too. This will be a great album to listen to in the upcoming Christmas season. Chris May, Ronnie Madrid, Bobberman and 2 others like this. Just received my order of the CD (I ordered two and had one sent to my brother). Is the title "The Christmas Wish" or "The Christmas Wish With Symphony and Choir"? I ask because the seeming subtitle is on the cover and the side. Received it and had to give it a preliminary listen. Absolutely beautiful! BTW, this was the first time in about 40 years that I've been able to listen to "I'll be Home for Christmas" without bursting into hysterical tears (my dad passed on Christmas day back in the 70s). Maybe there's hope for me yet.